Awards - Capital Paving Inc. Throughout the years, Capital Paving has earned the respect of industry partners and associations for our commitment to the community, the environment, and the road-building business. We have built a solid reputation as one of the most reliable and quality companies in the province, evidenced by a growing number of awards and achievements. The award reflects a rigorous independent process that evaluates management skills and practices. Building strong community relations is an essential part of Capital's philosophy. Capital is proud to receive the Community Relations Award for its volunteer efforts in the Township of Puslinch, with recognition in 2017 for work at Sunrise Therapeutic Riding & Learning Centre. Commitment to the environment is evidenced by a company's proactive approach to progressively rehabilitating its pits and quarries in a timely manner. Capital Paving is an industry leader in taking a proactive approach to its own operations. Once an area within the pit has been fully extracted, the land is rehabilitated as soon as possible. In most cases, the area is rehabilitated back to agricultural lands so it can be farmed to produce various crops while still remaining an active pit. This award is given by the Ontario Stone, Sand & Gravel Association. The Trillium Award is given by ORBA's Ontario Asphalt Pavement Council to recognize plants that go above and beyond the already 'gold' standard required by industry regulations. This award sets the standard by which all others are judged; good plant operators who are also good corporate citizens. Trillium Award applicants complete a rigorous assessment process to meet high standards in appearance, operations, environment, safety, and community relations. 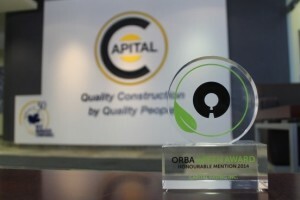 The Routly Safety Awards recognizes ORBA member companies for their superior performance in worker health and safety in three categories. Recipients are determined from statistics provided annually by Infrastructure Health & Safety Association. This award recognizes the companies that worked the greatest number of consecutive man hours without a lost-time injury, with Category II representing more than 100,000 man hours. The Paver of the Year Award is the most prestigious award given to a hot-mix paving contractor in Ontario. Only the highest quality projects are selected to receive this award. The projects are evaluated on smoothness, night paving, completion, workmanship, and mix quality. Capital was the first company to be awarded Paver of the Year three times. In the last 15 years, our six time ranking in the top 4 projects is testament to the exceptional quality provided by Capital. Georgian Business Administration graduate Geoffrey Stephens has been named a winner of the prestigious 2011 Colleges Ontario Premier's Award. Geoffrey Stephens, President, was honored to be selected for the Quantum Shift program as one of only 40 entrepreneurs and business owners from across Canada across a broad-range of industries. This program offered at the Richard Ivey School of Business in London, Ontario was designed for CEO's and business leaders to learn how to take their companies to the next level. Quantum Shift is awarded to business leaders that are innovative and insightful. The program challenges the entrepreneur to improve their leadership style, inspire their business partners and maximize their growth opportunities. This award recognizes organizations that have created excellence and enhanced business performance through their commitment to coaching as a leadership strategy. Over the past several years, Capital has been working closely with Sue Edwards, The Construction Leadership Coach to help execute and achieve success in its vision goals. "Prism Award recipients exemplify how coaching can develop an organization's human capital by maximizing individuals' potential and leading to high Return on Investment (ROI) and Expectations (ROE) from coaching interactions." Larry Wilson was honoured to receive the King Beamish Award of Excellence in March 2016, in recognition of his exemplary voluntary contributions to the industry and leadership as an active Director and Past President of the Ontario Hot Mix Producers Association. Each year the Grand River Conservation Authority recognizes the efforts of individuals and groups by presenting awards for outstanding examples of conservation and environmental work. Capital Paving, along with Dufferin Aggregates, received this prestigious award for its continued contributions to protect and enhance Mill Creek that flows through Puslinch Township and the City of Cambridge. Capital Paving was acknowledged by the Ontario Sand, Stone & Gravel Association with the Community Relations Award for our Wellington Pit in both 2009 and 2010. This increases the number of awards received by OSSGA to 18; testament to our strong commitment to the community and the environment. Capital Paving is proud to be the recipient of this award for its continued improvements to the Mill Creek Watershed. This award is given by the Ontario Stone, Sand & Gravel Association and is in recognition for Capital Paving's continued dedication and commitment to the protection of the environment in the communities it operates in. The Award of Excellence is the most prestigious achievement an operating pit or quarry can obtain in Ontario. This was awarded by the Ontario Stone, Sand & Gravel Association (OSSGA) in recognition of Capital's commitment to continued improvements in Progressive Rehabilitation, Property Enhancement, and Community Relations at our Wellington Pit operation. Since the inception of this most prominent award in the industry in 2001, this award has only been presented to a limited number of pits and quarries in Ontario. Capital's Wellington Pit is proud to be one of six current pits to join the ranks of elite operations.